Founder and leader of the choir „Pfarrchor“ at the St. Florian monastery in Upper Asutria (1987), founder oft he youth choir at St. Bridget, Vienna, which later became the choir „Kantoreisingers“ (1991), choir conductor oft he St. Lawrence Choir at the University of Kansas (USA); founder of the vocal ensemble „Oktogon“ in Vienna (2004). 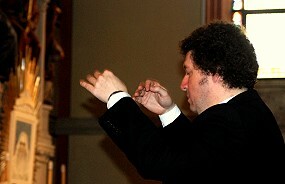 Numerous concerts and recordings; clinician at various choir conferences. Director of the Midwestern Catholic Youth Chorale in 2002 and 2003. “As a choir leader, it never took me more than a month to build up new choirs, no matter if that took place in my home parish, or in St. Florian, or in America. The last choir I founded in 1991 was called Kantoreisingers; this choir started with five 15-year-old-singers and developed to one of the best sacred choirs in Vienna, currently consisting of over 40 singers, mainly students from all over the country. So far, two CDs have been recorded (1998 and 2001) and are available under the labels WN 004 and KR 002 (manufactured by SONY).